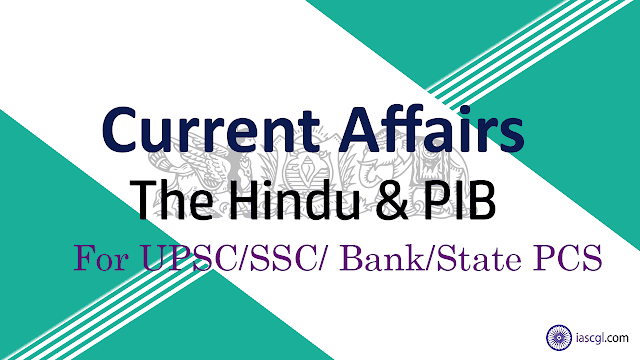 19th September 2018, Current Affairs and News Analysis for UPSC Civil Service Examination, SSC CGL and State Civil Service Examinations. The Delhi government signed a Memorandum of Understanding with the Seoul Metropolitan Government to work closely in the fields of environment, tourism, waste water and solid waste management, infrastructure and public health. The Mou on the 'Friendship and Cooperation Agreement' was signed by Delhi Chief Minister Arvind Kejriwal and Seoul mayor Park Won-Soon in Seoul, the capital of South Korea. The Delhi CM particularly sought the city’s expertise in dealing with transport and air pollution. The agreement has listed 11 areas for exchange of expertise and cooperation including environment, culture, tourism, smart city, transportation, education, land use planning and management, science and technology, MICE industry, waste water and solid waste management, infrastructure and public health. Air pollution: Air pollution is a major issue faced by Delhi almost throughout the year and especially during winter. Since the past two years, Delhi has witnessed very severe smog during winter. Landfill Management: Delhi with four towering landfills is still struggling when it comes to dealing with it. Water Crisis: The only river passing through Delhi- Yamuna- is facing serious water pollution problems. Hence, Delhi faces an acute water crisis every summer as it is dependent on neighbouring states for the supply. Public Transport: Though Delhi’s public transport system has seen vast improvement with the advent of the new metro lines and low floor buses, the state government is still trying to improve the experience, as the use of public transport will be key to fighting pollution and reducing congestion. This meeting was followed by signing of an agreement of cooperation between the India Tourism Development Corporation and La Societe Marocaine D’Ingenierie Touristique, also known as Moroccan Agency for Tourism development (SMIT). The central government has announced the merger of Bank of Baroda, Vijaya Bank and Dena Bank, making it as the third largest domestic bank entity. Merger to provide total business of more than ₹14.82 trillion. Union Home Minister Rajnath Singh on Monday inaugurated two "smart" border fencing pilot projects under the Comprehensive Integrated Border Management System (CIBMS) programme at Jammu's International Border (IB). The project is touted to be the government's important measure in border security. Each of two newly inaugurated border fencing projects covers a 5.5 km stretch along the international border. The system is said to be a first-of-its-kind high-tech surveillance system that will create an invisible electronic barrier on land, water, air and underground. This will help BSF detect and foil infiltration bids. The Maharashtra Government has taken the first step towards setting up a varsity dedicated to mitigating cyber threats. A 2015 skill gap analysis for Maharashtra by the consultancy firm KPMG had pointed to a gap of 1.5 crore professionals in 10 sectors. “Of these, there was a greater shortfall in the IoT and Cyber Forensics sectors. The new varsity will bridge this skill gap”. The current supply of cyber professionals in the country is about a lakh while the demand hovers around 30 lakh. A cyber-attack is taking place every 10 minutes as opposed to 12 minutes previously. The varsity will remedy this. Next generation mobile Internet connectivity will offer faster, more reliable networks that will form the backbone for era of IoT. Having missed the bus for early adoption of latest technologies in the past, India — one of the fastest growing telecom markets in the world — is pushing for a timely roll-out of 5G technology in the country. The Indian government is aiming to commercially introduce 5G services in the country by the end of 2020, almost in line with rest of the world. Once commercialised, 5G is expected to disrupt not only telecom but other industries as well as. 5G is expected to see use beyond delivery of services just on “personal phone platforms.” It will also connect new devices including machines, sensors, actuators, vehicles, robots and drones, to support a much larger range of applications and services. 5G is the next generation of mobile Internet connectivity that would offer much faster and more reliable networks, which would form the backbone for the emerging era of Internet of Things (IoT). Previous generations of mobile networks addressed consumers predominantly for voice and SMS in 2G, web browsing in 3G and higher speed data and video streaming in 4G. The transition from 4G to 5G will serve both consumers and multiple industries. Globally, over 150 pre-commercial 5G trials are under way around the world, including South Korea, China and the U.S., 5G trials are yet to begin in India. Globally, almost half of all companies expect automation to cut their full-time workforce in the next four years; however, new jobs will still lead to a net gain in employment opportunities if sufficient reskilling is done. 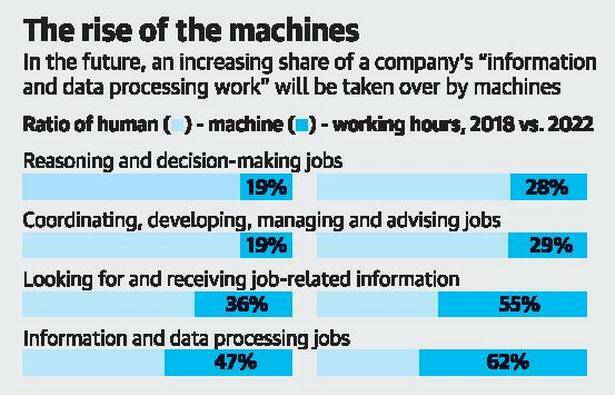 In India, 54% of employees in these sectors will need reskilling by 2022, the WEF said in the report. The trend could displace 75 million jobs globally by 2022.